Background: Psychophysiological coherence has been widely studied as a bodily state associated with general well-being and cognitive clarity. Heart Rate Variability (HRV) has been shown to be a good biomarker to assess psychophysiological coherence. This paper presents the first general set of results concerning a study that is part of a team effort between a body of researchers in 5 countries led by the HeartMath Institute under the name, International Heart Rate Variability Synchronization (IHRVS) Study. This study focuses on the effects that meditation has on both HRV and the Coherence Ratio. It is hypothesized that meditation improves coherence. Methods: Our research study was conducted at The Embassy of Peace in Whitianga, New Zealand with 22 participants, whose cardiac activity was measured via a FIRSTBEAT wireless HRV recorder, for a period of 15 days, 23 hours per day, plus an hour break per day for individual care of the body. In order to have an initial qualitative impression of the data, we developed a Coherence Ratio movie, which allows us to visualize very clearly both individual and collective HRV dynamics at different times during various activities. Results: We observed via the movie, a clear difference between meditation and other periods. We qualitatively demonstrate an improvement in coherence and we found, amongst other things, that 1 type of meditation, the Paradise Landing Meditation (PLM) conducted every day at 6:00 PM, shows significantly higher values for coherence. We compared quantitatively the PLM with other daily activities and show a significant improvement in coherence when in meditative states. Conclusions: We infer that meditative states might be beneficial to cognition and general well-being and propose that the heart together with the brain and the respiratory system are engaged in modulating cognitive clarity, something that we briefly explore and recommend for further investigation. It is well known from previous studies that yoga, relaxation and meditation practices show very particular brain waves (mainly Alpha), as well as higher coherence ratios and scores, as monitored with the use of HRV measurements [1,2,3,4,5]. We have observed these kinds of results qualitatively, and here we will also explore this general hypothesis quantitatively, only for coherence ratios derived from heart dynamics. The International Heart Rate Variability Synchronization (IHRVS) Study and additional studies we conducted at The Embassy of Peace in New Zealand were organized into a set of daily activities that presumably would have different effects in both HRV and the Coherence Ratio [6,7,8] for the 22 participants. These participants were from different nationalities (9 from New Zealand, 4 from Australia, 3 from Israel and 1 each from Germany, China, USA, Switzerland, South Africa and UK) and age groups ranging from 25 to 57, where 11 were female and 11 were male. All of them were healthy, however, 1 female participant was on post-surgery and rheumatoid arthritis medication and another was taking psychopharmaceutical drugs. These activities consisted of 3 types of meditation a day, starting at around 10:00 AM, 2:00 PM and 6:00 PM, for a 1-hour period each. It is important to note that the HeartMath Institute also led 2 global meditations with participants from all groups in each of the different countries on 2 occasions. In addition to all of this, each participant in the group at The Embassy of Peace performed 4 individual meditations spread out over the 15-day period, apart from the daily group meditations. This amount and mixture of meditation periods and types presumably allows for a good quantitative analysis. It is also important to note that 3 other types of activities were also tested in this study, however, the analysis of these activities is outside the scope of this paper and remains the topic for future studies. Our first particular hypothesis states that meditation periods should show significantly higher coherence ratios than baseline and any other daily activity, while our second particular hypothesis states that baseline periods are expected to show lower or similar coherence ratios than any other daily activities. Following, we briefly introduce the reader to a broader understanding of the complexities associated with cognitive clarity, psychophysiological coherence and inner peace, presumably related to meditative states and the creation of knowledge and meaning in the brain associated with positive emotions. A good beginning is to remind the reader that cognitive clarity also associated with cognitive performance pertains to mental processes and states in the acquisition and application of knowledge with clarity (ease and fluidity) while being aware of thought, experience and sensory information. When we refer to clarity we should also consider spiritual or subjective states where the quality of being coherent and intelligible becomes salient, as for example, when a human being displays clarity of purpose and intention or qualitatively the purity of thoughts and relatedness when in appreciation of others. Sensory wise we can also add the capacity of appreciating beauty, color and melody for example, where the scenery or the environment becomes very salient, sharp and clear. It is with a combination of these subjective and objective cognitive states where we can imagine and experience that, which is a desirable cognitive performance as when an artist plays on an open stage in nature and the moment becomes very enjoyable, beautiful and strikingly memorable, something that we could relate to a peak experience à la Maslow . However, what in the world has that got to do with HRV, psychophysiological coherence and inner peace? The answer to this question is extremely complex and outside the scope of this study, yet we must say that psychophysiological coherence has been associated with cognitive performance and emotional stability  and very well explained by [52,53]. Measures for psychophysiological coherence can be derived from HRV and they are associated with stress reduction, something that could be intuitively and subjectively also associated to some form of inner stability, accompanied with a sense of inner peace and harmony, an experience which is common to most humans, even if for brief moments in life. Based on the above, it seems to us that there are good grounds to think that psychophysiological coherence is somehow associated with cognitive clarity, general well-being and inner peace. It has been proposed that brain, heart and respiration dynamics are highly interdependent, particularly in mediating coherent states and also certain cognitive states . Also, these oscillatory systems could display some form of metastability as observed in brain dynamics associated with different cognitive states [10,11,12]. As an integral part to a brief review and comprehension of perception, awareness and spiritual experience , we have turned our consideration to the work of  regarding the cooperation between the brain and the heart which is mediated by respiration, keeping in mind the end goal, to do equity to the expansive assemblage of ancient wisdom, philosophical thought and logical hypotheses which bolster the theory that the “heart” plays a principle part in “basic leadership” and decision-making and the handling of “more profound” spiritual implications, some of the time related to feelings and Universal Values, similar to Love and Compassion [15,16,17,18]. In most recent years Kozma and Davis [19,20,21,22] have propelled the improvement of a methodology to study brain dynamics inspired by the work of Walter Freeman and others. This methodology is intended to identify the points of interest, as well as the inconveniences of applying spatio-temporal analysis on brain signals towards the investigation of mind and consciousness , as manifested and distinguished in snapshots of synchronizations and de-synchronizations in neural dynamics crosswise over expansive cortical regions. These kinds of brain dynamics are presumably identified with higher perception and the formation-creation of knowledge and meaning [24,25] and the advantages related to utilizing the procedures of EEG measurements, as prescribed by Freeman and Quiroga  and studied by Davis, Kozma and Freeman in collaboration with Lin and Gillett [27,28]. Freeman and others have already suggested that meaning creation requires previous and new knowledge and in turn the brain also needs to derive meaning from internal and external events in order to create or produce new knowledge [19,21,22,29]. However, even with the advent of the era of information technology, how the brain and now presumably the heart takes part in the creation of our most intimate meanings or even the trivial ones still remains a mystery, and perhaps the time has come to attempt genuine endeavors to explore more deeply such a mystery. Be that as it may, this is out of the extent of this paper and we will concentrate in the near future on the examination of the results obtained in this IHRVS study, in order to derive deeper insights and understanding on the subject and potentially encourage more investigation towards the development of procedures and methodologies that would allow us to relate mind-brain-heart dynamics . With this in mind we aim at a deeper understanding of the role of the heart in the embodiment of Spiritual Values in intentional behavior. This work will introduce several variables and parameters that were computed based on the measurements of heart dynamics for each participant in order to look at daily activities in contrast with meditation, presumably associated with different states of being. In order to facilitate a standard language, peaceful or harmonious states of being will be referred to as analogous or similar to psychophysiological coherence and used interchangeably. This is on one hand, because it simplifies a philosophical subject, which is outside the scope of the present study and on the other hand because we are convinced that the term psychophysiological coherence describes relatively well, in a scientific manner, a point of entry to higher cognitive meanings in the realms of psyche, soul, spirit and body . Our line of research carries the potential to advance the understanding of decision-making in the context of Universal Spiritual Values and the power associated to that, something that more likely would lead to constructive intelligence and peaceful behaviors for the benefit and spiritual development of future generations . A good start is in the understanding of the power of meditation and other presumably beneficial activities that may lead to stress reduction and cognitive clarity. Informed consent was obtained from all 22 participants who took part in this experiment here at The Embassy of Peace in Whitianga, New Zealand. In order to obtain measurements from heart dynamics, we used a FIRSTBEAT Bodyguard 2 HRV recorder that operates 24 hours a day and records R-R intervals . The device is attached to the skin, after shaving when necessary, with two chest electrodes that once connected, start recording data automatically. The main technical specifications of the device are as follows: (a) rechargeable battery with a life of ~6 days; (b) 20 days storage capacity; (c) charging time ~1 hour; (d) weight 24 g; and (e) sampling frequency 1000 Hz. Coherence Ratio as a function of Total Power (TP) and Low Frequency (LF). Mean of R-R intervals (time between heartbeats). The standard deviation of R-R intervals (SDNN). As part of this initial visual inspection and basic statistical analysis, we developed a movie that displays the behavior of the group (22 participants) simultaneously, in frames of 5 minutes each while engaged in different daily activities and meditation periods . The quantitative analysis is based on the IBI data from which we compute the Power Spectrum Density (PSD) in order to derive an acceptable Coherence Ratio according to literature . We performed graphical and statistical analysis of the Coherence Ratio (CR) mean values, where we computed confidence intervals for the CR mean values for every participant and all conditions analyzed. We also performed a set of hypothesis tests to find out if the CR mean values were equal or different for the distinct conditions as means to test the hypothesis that meditation periods will show higher values for the CR. The environment in which we conducted the experiment was a rural, native bush kind of environment in Whitianga, very pleasant and peaceful, and the planned meditations were conducted, for most of them, inside the house in a very spacious living room. Other meditation periods were done outdoors. Here on site, the weather was warm-hot, since February – March is summer time in New Zealand. We planned a set of investigations in light of the data we obtained, so as to first understand the behavior of: (1) the baseline or regular HRV of a participant (probably his or her typical, more likely day-by-day state of being) and (2) HRV during meditation and rhythmic breathing practices. Randomly chosen 30-minute periods outside the daily planned activities, meditations and sleep times, intended to capture each individual’s own random day-to-day activities, which we consider appropriate as a baseline. Heart Lock-in Meditation as described by The HeartMath Institute (Meditation 1). Participant’s meditation of choice (Meditation 2). Paradise Landing Meditation: (a) listening to a piece of poetry about Spiritual Values by the name of Paradise Landing , followed by (b) chanting the sounds of the associated Hebrew letters to each Value and then the syllable ‘OM’ (Meditation 3). Heart Lock-in Meditation (HLM) on 6 March, 2015 from 6:00 AM to 6:15 AM, New Zealand time (Global HLM 1). Heart Lock-in Meditation on 12 March, 2015 from 6:30 AM to 7:00 AM, New Zealand time (Global HLM 2). The 4 individual planned HLMs for all participants were at the time and date of their choice. It is important to note that creating an arbitrary baseline activity is different from allowing each individual to go about their day doing their own random activities, which we consider more appropriate for a baseline. This allows us to compare meditation periods with ordinary leisure time that serves as a contrasting background activity, our baseline. This first paper will cover the analysis of different activities: Baseline or regular activities, the daily planned meditations and the Global HLMs. However, we will focus on the quantitative analysis of the Coherence Ratios for: (1) Paradise Landing Meditation (PLM), (2) other daily scheduled Group Activities (GA) and (3) Baseline. In this section we introduce the reader to a set of general results and analysis concerning individual and group HRV measures during different types of activities. Figure 1 Evolution of HRV and Coherence measures over periods of 5 minutes per participant over a period of 15 days. 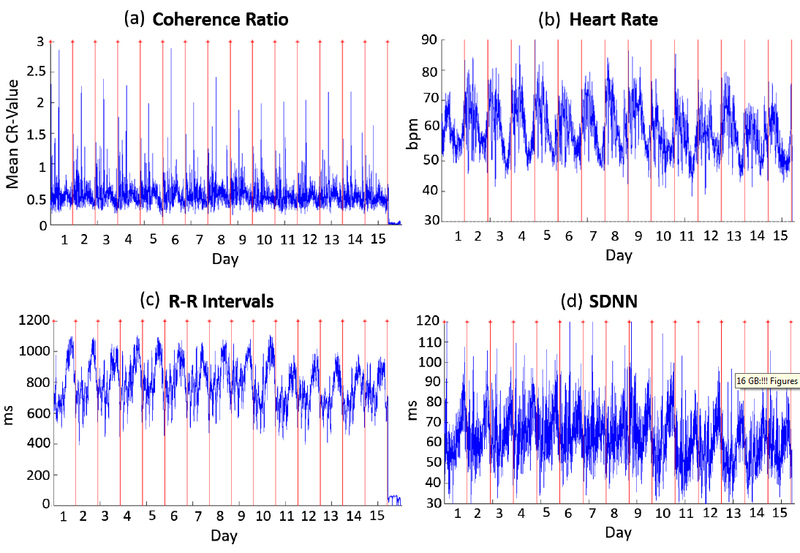 Top left: Coherence Ratio (a), Top right: Heart Rate (b), Bottom left: R-R intervals (c) and Bottom right: SDNN (d). The formula that we use for the CR, for this initial analysis, is based on the power spectrum calculated over each period of 5 minutes and is a function of Low Frequency Power (LFP) and Total Power (TP), as described in [9,34,35,36]. 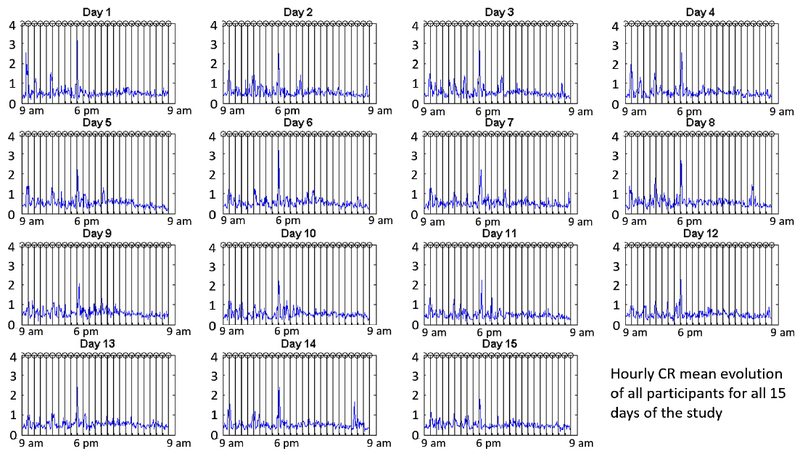 In Figure 2, we observe the same behavior for the CR for each day and now we can see the pattern when we average the values of all participants per day. We clearly observe the difference between awake and sleep states and we point to the fact that for every day there are 3 periods: 10:00-11:00 AM, 2:00-3:00 PM and 6:00-7:00 PM where we observe high peak values for the CR and the highest, in particular being, between 6:00-7:00 PM for all days. It is important to note that these periods correspond with the 3 daily planned meditation periods and that the last one corresponds to the Paradise Landing Meditation period explained above in the previous section. We can also observe significant fluctuations in other periods associated with some of the other activities, however, these values seem significantly smaller than the meditation periods, at least so far at this level of visual analysis. We also observe that the Global HLM on the 6th and the 12th of March, show a significantly high value at around 6:00 AM (Figure 2: plots 8 and 14 towards the very far right). Figure 2 Daily average for all participants of the evolution of the mean CR over periods of 5 minutes per participant for each of the 15 measured days. First, top row from left to right: Day 1, Day 2, Day 3 and Day 4. Second row: Day 5, Day 6, Day 7 and Day 8. Third row: Day 9, Day 10, Day 11 and Day 12. Finally, last row: Day 13, Day 14 and Day 15. The next Figures, 3 and 4, give a very clear impression of the overall average daily dynamics. In Figure 3 (CR values), we can point to very distinct behaviors for the meditation periods when compared with regular daily activity periods. From 9:00-10:00 AM, low coherence with a lower peak just before the Meditation 1 period due to an hour disconnection period for daily care of the body and device battery recharge, for around a third of the participants. From 10:00-11:00 AM, a dramatic increase in CR for the first 30 minutes of meditation with a drop towards the start of daily activities. From 11:00-12:00 AM-PM, medium CR values during daily group activities. From 12:00-01:00 PM, a sudden drop due to the 1 hour disconnection period for around a third of the participants. From 01:00-02:00 PM, low coherence with a lower peak just before the Meditation 2 period. From 02:00-03:00 PM, a dramatic increase in CR for the first 30 minutes of meditation with a drop towards the start of the next activity. 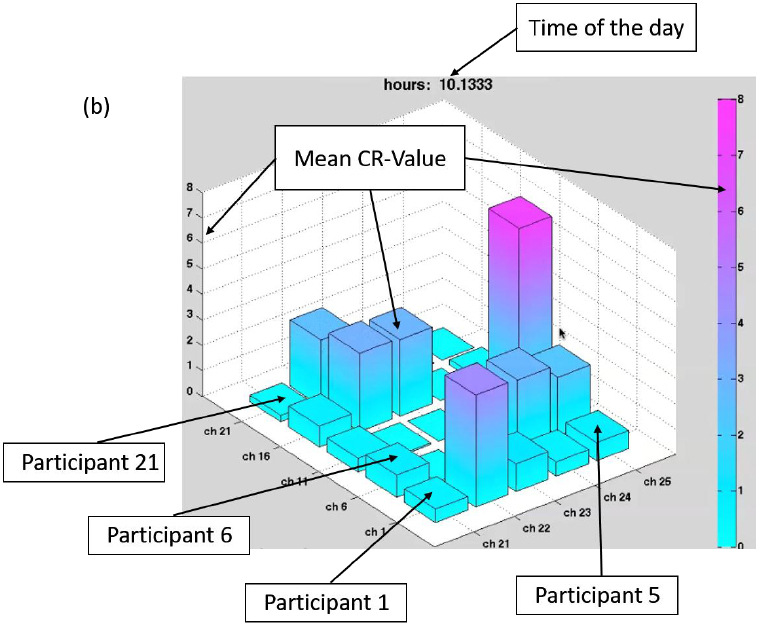 From 03:00-04:00 PM, medium values for CR during other daily group activities. From 04:00-05:00 PM, a sudden drop due to the 1 hour disconnection period for another third of the participants. From 05:00-06:00 PM, low coherence with a lower peak just before the Meditation 3 period. From 06:00-07:00 PM, a dramatic increase in CR for the first 30 minutes of meditation with a drop towards the start of the next activity. From 07:00-08:00 PM, medium CR values during other daily group activities. From 08:00-09:00 PM we observe a drop in coherence due to the 1 hour disconnection period for the remaining 3 participants. From 09:00 PM onwards, until the next morning, the CR gradually drops reaching the lowest values. Figure 3 Daily overall average for all participants showing the evolution of the mean CR over periods of 5 minutes with 95% significance confidence intervals. Note that the hours of the day (x axis) start at 9:22 AM and they move by steps of 1 hour to 10:22 AM, 11:22 AM and so on. In Figure 4 (a) we can observe that the lowest HR values are associated with the 3 meditation periods 10:00-11:00 AM, 02:00-03:00 PM and 06:00-07:00 PM. In Figure 4 (b), we point to the fact that the SDNN together with the HRV drop significantly very close to 10:22 AM, 02:22 PM and 06:22 PM for each of the 3 meditation periods respectively and precisely when the CR present the highest values. 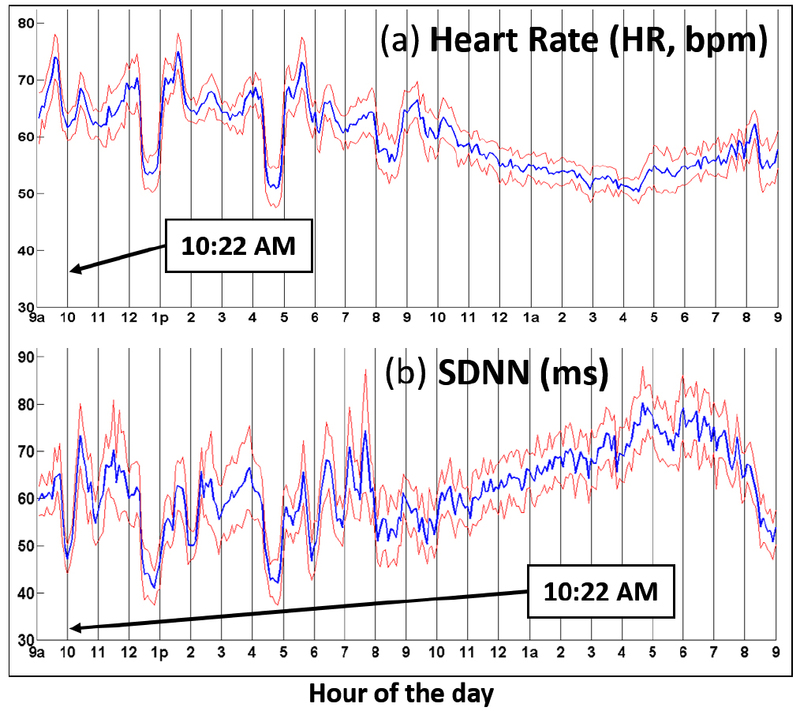 It is also important to note that in both graphs we can clearly observe the 4 daily disconnect periods associated with significant drops in the variables HR and SDNN for periods of around an hour. In general, similar conclusions as the ones already mentioned before can be drawn from the graphs in Figure 4, something that should be expected since all of these variables are closely related. Figure 4 Daily overall average for all participants showing the evolution of HR (a) and SDNN (b) over periods of 5 minutes with 95% significance confidence intervals. Note that the hours of the day (x axis) start at 9:22 AM and they move by steps of 1 hour to 10:22 AM, 11:22 AM and so on. Finally in Picture 1, we introduce the reader to some of the frame sequences extracted from the movie that we created to visualize the CR for group dynamics, for every 5 minutes of the day, for the 15-day experiment. The movie revealed very similar, though more subtle, dynamics to the ones shown in the previous figures, with the added value of the group dynamics displayed for every participant, frame by frame over time, for the CR values for each 5 minute interval. Watching this movie preceded other analyses and was very informative, and in some cases inspirational since it stimulated the research group to the future more in depth exploration of group coherence dynamics. Finally, this exploration also pointed to the kinds of figures (1,2,3,4) we needed to present to the reader. We certainly recommend watching the movie (https://thescienceofpeace.weebly.com/experiments--research.html) to fully appreciate the complex daily dynamics of CR values across the different hours through all days and the effects of different daily activities and meditations . Picture 1 Movie frames showing CR values at different times during the day for different conditions from left to right for periods: Sleep time (a & f), Meditation 1 (b & g), 1 of 3 daily group activities (c & h), Paradise Landing Meditation (d & i) and Baseline (e & j), for Day 2 (a-e) and Day 3 (f-j). 1 of the frames (b) has been enlarged and provides a detailed description of how to interpret each of the 10 provided movie frames. The first 22 blocks represent 1 of the participants, displaying their CR mean value at the identified time. It is important to note that blocks 23-25 are inactive. From all types and periods of meditation we selected the Paradise Landing Meditation (PLM) periods for the sake of simplifying the analysis and scope of this research. It is important to note that qualitatively, the PLM shows higher CR mean values than the other types of meditation, something that should be reflected in our hypothesis testing. A more thorough analysis about the power of each type of meditation is left for future research. Also, although we collected data from the PLM period, for: (a) listening to a piece of poetry about Spiritual Values by the name of Paradise Landing, followed by (b) chanting the sounds of the associated Hebrew letters to each Value and then the syllable ‘OM’, we considered the PLM period for this study as a whole. Another study of the effect of each part of the PLM period regarding the CR would make a good paper unto its own right, something which is outside the scope of this work. However, informally we can say that from previous experience of some individuals who have provided anecdotal evidence, chanting OM has a different effect on HRV and the CR than chanting Hebrew letters. It is also important to mention that listening to a reading is context and reader dependent, in terms of information related emotional content, which means that for some particular reading material, some people may show an increase in CR while others show a decrease. The same applies to the reader. In our case, we hypothesize that all these practices prepare the meditator for a deep experience with high CR associated to it. For now we can only say that generally speaking, as 1 person reads the poetry the average community CR starts rising while everyone is listening in stillness, showing an increase and reaching a peak most likely during a part of the chanting period, followed by a drop as the end of the PLM period approaches. We can speculate about why this happens, however, we prefer to defer any comments or conclusions until we can back them up with further analysis in future studies. This section will present the results obtained from analyzing the data associated to: (1) Paradise Landing Meditation (PLM) periods conducted at a set time every day as mentioned above and (2) other daily scheduled Group Activity (GA) periods and (3) Baseline periods. These periods all have duration of 30 minutes. Hypothesis 1: The PLM recording period should show significantly higher CR mean values than GA and Baseline periods. Hypothesis 2: Baseline periods are expected to show lower or similar CR mean values than all GA recording periods. It is important to note that the Baseline periods were identified as any of the 30 minute periods that a participant went about his or her own choice of activities aside from all the GA and Meditation periods. This Baseline period served as a control activity or reference, which could lead the participant to either coherent or incoherent states, depending on their level of self-mastery and stress management skills. GA and Meditation periods were planned and designed to presumably facilitate the participants in accessing more coherent states than in individual baseline. Following, we present some results where we include 2 different sets of GA periods (GA 1 and GA 2). In Figure 5 we display the confidence intervals with 95% confidence and with their respective CR mean values associated with GA 1 and PLM periods. Here we observe that most participants show statistically significantly higher values for the CR’s for PLM where most of them are very high with few high and low CR’s. As observed in previous graphs, this statistically significant improvement in the values associated with the CR comes without surprise, since it was expected to be quantitatively so for most participants during PLM. Only 2 participants (No. 9 and 10) showed higher values for GA 1 than for PLM and only 1 participant (No. 3) displayed statistically the same mean values. Figure 5 Confidence intervals with means for the CR associated to: (a) GA 1 (purple circles and light pink intervals) and (b) PLM (white squares with dark green borders and black intervals). Figure 6 displays the confidence intervals with 95% confidence and with their respective CR mean values associated with another set of GA periods (GA 2) vs. the same PLM periods. Here again we observe similar results, since the CR mean values of the PLM are significantly higher, generally speaking, than the CR mean values for this second set of GA periods. It is important to note that for this set of GA periods (GA 2), only 1 participant (No. 10) shows significantly higher CR mean values. Figure 6 Confidence intervals with means for the CR associated to: (a) GA 2 (purple circles and light pink intervals) and (b) PLM (white squares with dark green borders and black intervals). In Table 1 we show the results based on a test for differences between CR mean values for the participants in the 2 sets of GA and PLM periods. These tests are performed in order to confirm the null hypothesis (H0) that the difference between means equals 0, same means; or alternatively their difference is greater than 0, different means. Table 1 Hypothesis test CR mean values for GA 1, GA 2 and PLM. Hypothesis testing for same mean values of CR between activities: GA 1, GA 2 and PLM. Accept H0 = 0, reject H0 = 1. The number of participants with low CR amounts to 8. The number of participants with high CR amounts to 7. The number of participants with very high CR amounts to 5. The number of participants with low CR amounts to 13. The number of participants with high CR amounts to 2. The number of participants with low CR amounts to 3. The number of participants with very high CR amounts to 15. Based on the above summary we can observe that the majority of participants (12 of them) show high or very high CR’s for the first set of GA periods (GA 1) while in the case of the second set of GA periods (GA 2), this number was reduced to only 7 participants. During PLM almost all participants show high or very high (2 and 15 participants respectively) CR mean values. In Figure 7 we display a comparative graph between the 2 GA periods and Baseline CR mean values. Generally speaking, we can observe that the GA and Baseline periods preserve the differences between participants for most of them, meaning for example, that Participants 3 and 4 always have higher CR mean values than Participants 14 and 15. We also observe that CR mean values associated with Baseline fall between the CR mean values of GA 1 (mostly above or equal to Baseline) and GA 2 (mostly below Baseline). It is important to mention that these 3 different sets of CR mean values (GA 1, GA 2 and Baseline) per participant are significantly smaller than the values associated with the PLM period, as will be shown in Figure 9 (only in relation to Baseline). Figure 7 Comparative graph of CR mean values for the first and second set of GA periods (GA 1 & GA 2) and Baseline for the 20 participants (x-axis) recorded on site. In Figure 8 we display the results of the hypothesis test that the CR mean values for each participant are equal for Baseline and GA 1 as well as for Baseline and GA 2. If the mean is different we reject the hypothesis and these results are codified as: accept H0 = 0, reject H0 = 1 (for CR mean values greater than Baseline) and reject H0 = -1 (for CR mean values less than Baseline). It is clear from Figure 8 that generally speaking, the CR mean values of GA 1 are statistically significantly greater than or equal to the CR mean values associated with Baseline, while the CR mean values of GA 2 are statistically significantly smaller than or equal to the CR mean values associated with Baseline. Finally, it is important to mention that most people with CR mean values below Baseline, for both GA periods, also showed small CR mean values for Baseline. 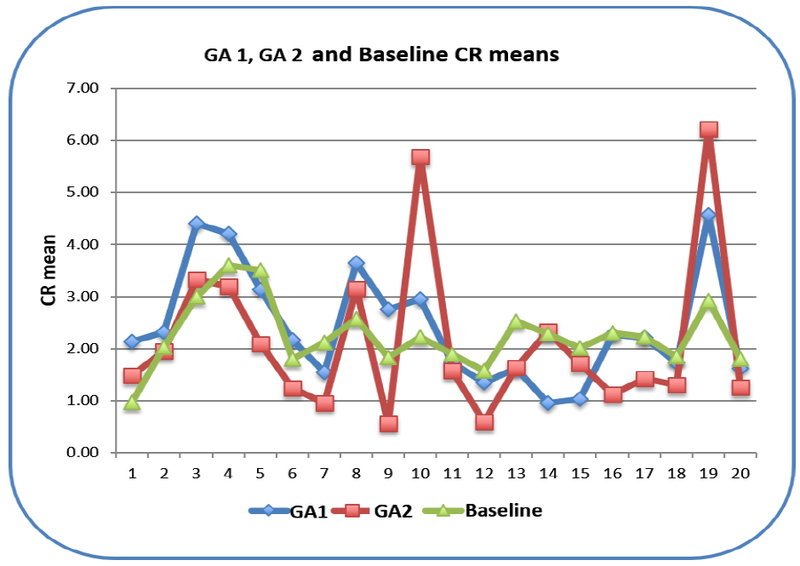 Figure 8 Hypothesis test results showing whether the CR mean values for each participant (x-axis) are equal for Baseline and GA 1, as well as, equal for Baseline and GA 2. The test displays 3 possible results: accept H0 = 0, reject H0 = 1 (for CR mean values greater than Baseline) and reject H0 = -1 (for CR mean values less than Baseline). 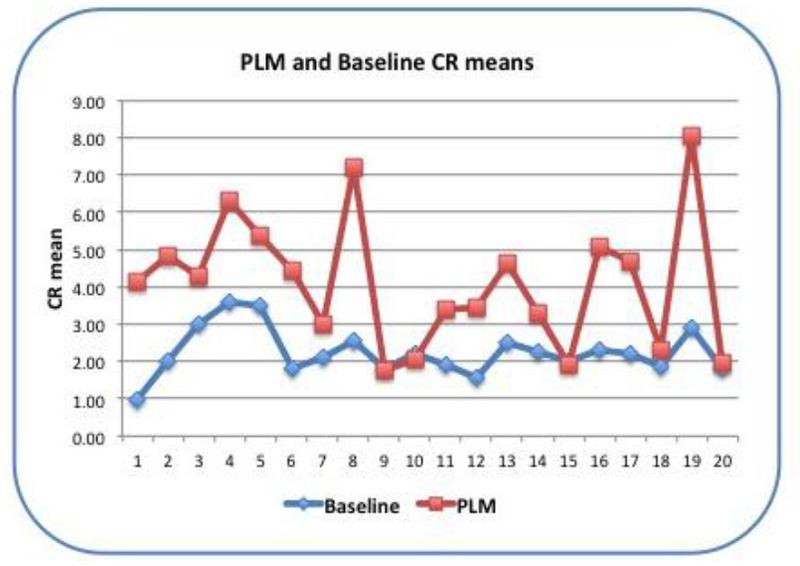 In Figure 9 we compare the CR mean values of PLM and Baseline, where it is evident, that the great majority of the participants show significantly higher or equal CR mean values in PLM than in Baseline. Note that many of the relative values between participants are still preserved for the majority of them, apart from a few exceptions, where for example, the CR mean value of Participant 3 drops slightly relative to Participant 2 for PLM, while for Baseline it slightly rises. Generally speaking, it appears that some participants are consistently more coherent than others across the day and the different activities. Figure 9 Comparative graph of CR mean values for PLM and Baseline for the 20 participants (x-axis) recorded on site. 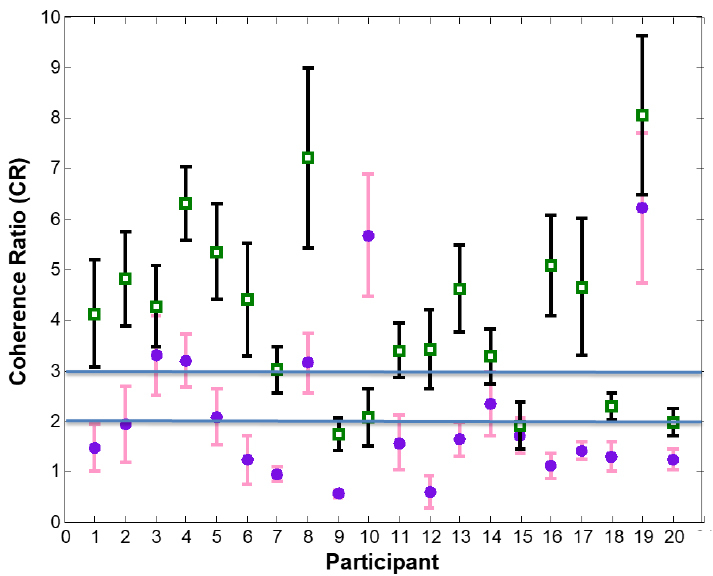 In Figure 10 it is easy to note that most of the CR mean values for each participant are significantly different and higher for PLM than for Baseline periods. This can be appreciated in the fact that most of the results of the hypothesis test for equal means are rejected showing values of 1. It is also important to note that no participant showed smaller CR mean values for PLM than Baseline where only 5 of them are statistically speaking, equal means. 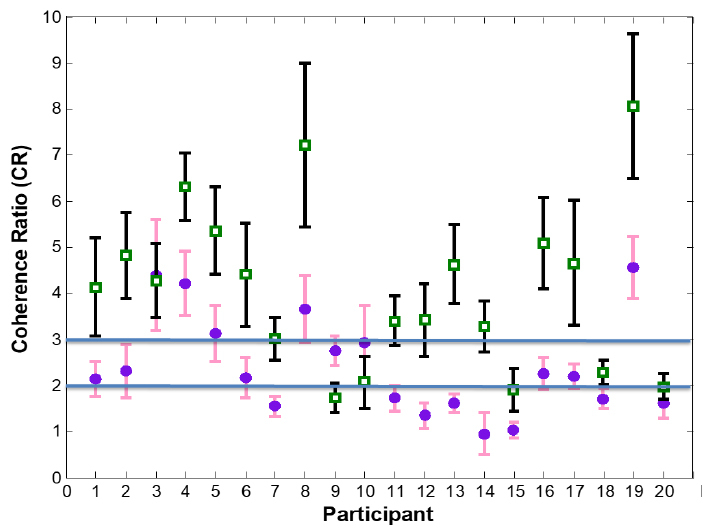 Figure 10 Hypothesis test results showing whether the CR mean values for each participant (x-axis) are equal for Baseline and PLM. The test could display 3 possible results: accept H0 = 0, reject H0 = 1 (for CR mean values greater than Baseline) and reject H0 = -1 (for CR mean values less than Baseline). With all of these observations in mind, now we are ready to discuss the implications of this set of presumably beneficial meditative activities (particularly in the case of PLM) for human performance and general well-being, and in all certainty, for us this goes hand in hand with the mastery of individual inner peace as a means towards social harmony. Hypothesis 1: The quality of the PLM period certainly shows significantly higher CR mean values than the 2 GA periods for almost all participants. Hypothesis 2: Concerning Baseline periods, we found a surprising result, where these periods showed CR mean values that were between the 2 sets of GA periods for most participants, indicating that some daily activities, generally speaking, may create a better than baseline result, while other activities may manifest a worse than baseline condition. Certainly, these differences require more investigation that is left for future research. 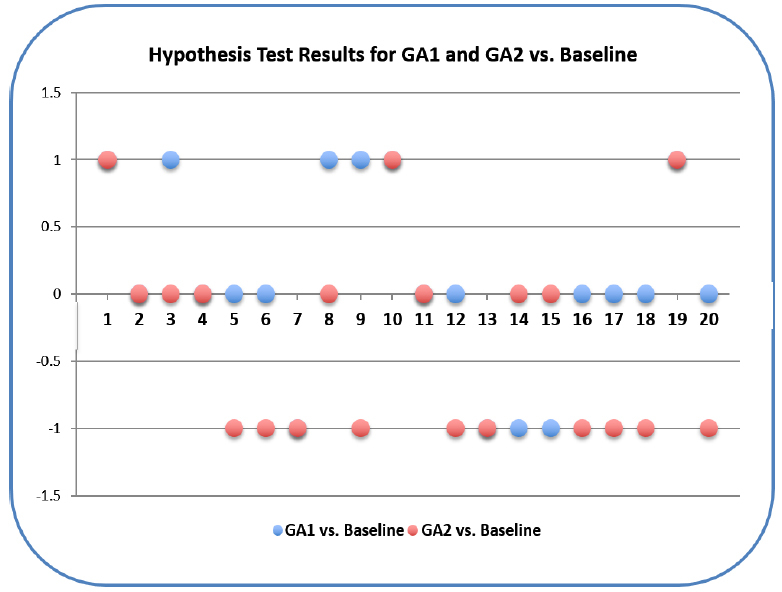 These results were unexpected and therefore so far we must reject the second hypothesis that GA would improve Baseline. 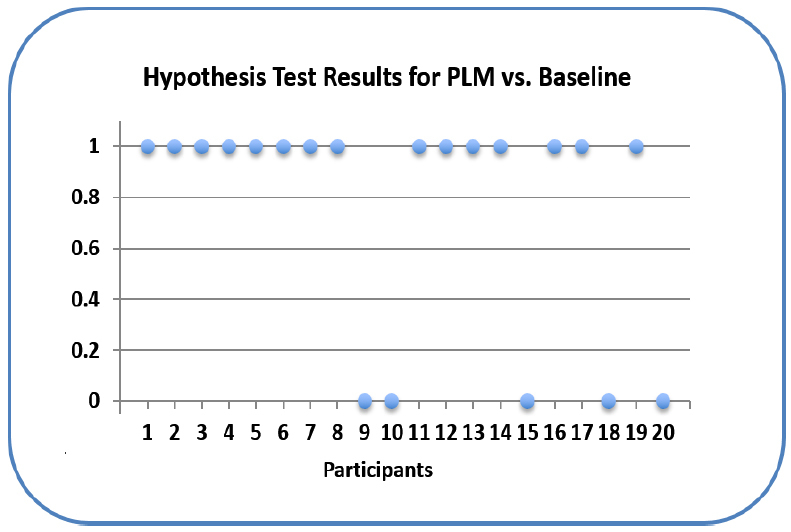 So far we can state that the PLM periods show substantially and significantly higher values in coherence ratios for both: (a) most people who practice PLM daily, genuinely and with strong commitment, as well as (b) for others who were unfamiliar with the PLM previous to the study. With GA and Baseline we observe a quite diverse set of results. Before we draw any conclusions, we need to mention that in previous studies [38,39,22] it has been hypothesized that the brain needs to consume energy in order to create meaning and knowledge for intentional action . It is also expected that familiar and pleasant information will be processed with less stress and energy demands than foreign and unpleasant information. Based on that we can now understand that for some people, the particular GA tested in this study could be stressful while for others these same activities would be neutral or pleasant. At this stage we are ready to move on to our final sections for future potential research. Looking into the future, we foresee the possibility to develop a comprehensive methodology in order to better facilitate the analysis of the complexities involved with this study. This methodology ideally will include some definitions, mathematical concepts, graphs and movies in order to quantify and easily identify potential meaningful events in terms of participant’s heart coherence, differences and similarities across participants, synchronizations between subjects and local and nonlocal interactions. The first definition is the one of “Ideal Coherence” which is pointing out an individual’s ability to sustain heart coherence continuously through a whole period of measurement and data collecting time, an epoch. “Ideal Coherence” should be measured with some form of standard in order to be compared with the level of coherence measured as time evolves. We suggest the Cumulative Coherence Score  to be an indicator of cumulative heart coherence or “coherence performance” as time goes on and, when contrasted with the ideal score along time within a certain epoch, it should tell us how well the participant performed in terms of heart coherence. It is important to note that this score ideally should follow a linear growth that can be calculated in terms of the best possible rewards (associated to heart coherence) per unit of time. Then it would be a matter of contrasting the ideal line with the trajectory of each epoch to compare them in terms of coherent or stressful periods. This would also allow us to compare: (1) level of performance across participants, (2) performances when engaged in different tasks and (3) influences of particular tasks associated to a time interval within an epoch when applicable. Using a similar approach we could also compare both local and nonlocal interactions and synchronizations between participants. In the future, we intend to investigate the likelihood of nonlocal correspondence and synchronization or entrainment between individuals that may be reflected in their heart rhythms as a possible indication of some form of communication or interaction between them via fields, whether classical or quantum. This is, we consider, a valuable undertaking since it could reveal a significant feedback structure and correlation between participants in terms of heart coherence, as well as, their ability to positively or negatively influence or be influenced locally and nonlocally by other participants [37,42,43]. All of this gives us an insight into the universe of possibilities to explore interpersonal subjectivity  in association with both local and nonlocal communication and synchronization. In order to derive a more efficient way of evaluating these kinds of interactions, we could utilize a measurement based on the mathematical concept of the “Euclidean Distance” (ED) or the Norm2 between 2 vectors, to track their evolution with their differences and similarities and then obtain information about their correlations. In this initial study we have conducted experiments to compare Baseline HRV and Heart Coherence Ratios with measurements of these physiological indicators when performing daily activities or meditation individually or collectively. This we have done in order to initially assess: (a) individuals’ Baseline, (b) the effect of presumably beneficial as well as energy consuming activities, as reflected in Heart Coherence Ratios, and (c) the effect that certain group activities like meditation have in facilitating psychophysiological coherence. In general it seems very plausible that participating in any creative and positively engaging activity like meditation, could generate a sense of well-being and cognitive clarity for the person. Consequently, this may also go hand in hand with a substantial improvement in psychophysiological coherence when compared to other activities and to baseline states. Even though measures and quantifiers of well-being and cognitive clarity have been left out of this study, there is already some literature available connecting them to psychophysiological coherence [51,52,53], as we have outlined in Section 1. A thorough study of their connection is desirable, yet outside the scope of this work. We conjecture that meditating or engaging in meaningful group activities could generate some form of synchronization between individuals and peak experiences [45,46,47,48,49], however, we need to incorporate some other research paradigms and methods to reliably capture local and nonlocal synchronization as a consequence of the onset of group peak experiences. It is a challenge for science to capture local and nonlocal synchronizations between individuals reflected in both HRV and brain dynamics. We propose that, though this is a difficult task, it is worthwhile pursuing a better understanding of it. We feel that, together with others, we are making a first attempt and our first steps to formulate a methodology to accomplish this challenge. We also appreciate and have taken into consideration the work of prophets and prophetesses, philosophers and scientists who have attempted or contributed directly or indirectly to this unifying objective through different disciplines. One of the biggest challenges for science, philosophy and ancient wisdom has been to understand and explain how to harmonize the subjective~objective, internal~external, physical~spiritual and individual~collective complementary pairs  regarding consciousness, personality and identity, as expressed in peaceful social interactions. We foresee that these kinds of studies will contribute to such a possibility by providing technologies to reinforce spiritual practices with biofeedback systems. It is our aim to deliver a collection of papers in the near future where we will concentrate on displaying an arrangement of results to demonstrate that the heart reflects both emotional and physiological states that can be identified with stress and tranquility, something as of relatively recently called psychophysiological coherence or essentially, the cognizance of the heart [9,51]. This particular study is intended to be an initial move towards an approach to legitimately attempt a synthesis between scientific knowledge and understanding and ancient spiritual wisdom, and to gauge and portray some form of causality associated with a sense of being and identity that supports spiritual learning about Universal Values and existential meanings. This seems to us very relevant to human leadership in the “art and now science” of peaceful living, closely associated with psychophysiological coherence . 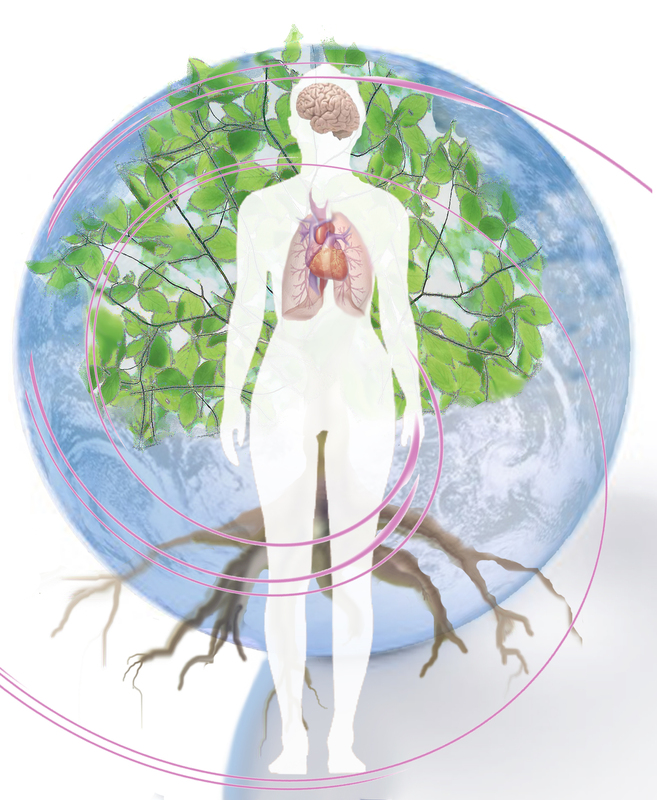 We also propose that our next frontier would be the study of heart-brain dynamics and decision-making as a means to better understand and comprehend the embodiment of Spiritual Values towards a peaceful planetary society. We want to acknowledge the people at The Embassy of Peace in Whitianga, New Zealand for their dedication and contribution to this study, particularly to Carey, Keryn, Sarah, Kali, Enya, Shiloh and Stevie, and in all certainty Kenny who is a continuous source of inspiration and Love. We especially want to acknowledge all our participants to whom we are extremely grateful for their time and endurance. We extend this sense of gratitude also to their family members who had to wait patiently for their return home. We want to extend even further, our sense of gratitude to Rollin McCraty and Mike Atkinson from the HeartMath Research Center for their kind support when designing and coordinating the International Heart Rate Variability Synchronization Study, as well as other organizations and institutions in other countries like Saudi Arabia, Lithuania, United Kingdom, United States of America and the second group in New Zealand for their time, their kindness and valuable collaboration. Finally, we thank greatly the unconditional support of all the people who anonymously or personally kindly lent or gifted equipment, or provided any other gifts like goods and services, as well as altruistic and voluntary work together with the team at The Embassy of Peace here in New Zealand and overseas. Jeffery Jonathan Joshua (ישוע) Davis acted in the capacity of main researcher and author. Florian Schübeler contributed significantly with the analysis of the data and the writing of the text. Robert Kozma acted as an overseer of the quality of the study with his expertise in brain, heart and respiration dynamics, cognition and the creation of knowledge and meaning in the brain, together with his deep understanding of complex systems modeling and analysis. This research did not receive any grant or other resources from funding agencies in the public, commercial, or not-for-profit sectors. Echenhofer FG, Coombs MM. A brief review of research and controversies in EEG biofeedback and meditation. J Transpers Psychol. 1987; 19: 161-171. Leonaite A, Vainoras A. Heart rate variability during two relaxation techniques in Post-MI Men. Electron Electr Eng. 2010; 101: 107-110. McCraty R, Childre D. Coherence: Bridging personal, social, and global health. Altern Ther Health Med. 2010; 16: 10-24. McCraty R, Atkinson M, Tomasino D. Science of the heart: Exploring the role of the heart in human performance. Boulder Creek: HeartMath Research Center, Institute of HeartMath; 2001. Childre D, Cryer B. From chaos to coherence - The power to change performance. Revised ed. USA: HeartMath LLC; 2008. McCraty R, Atkinson M, Tomasino D, Bradley RT. The coherent heart: Heart-brain interactions, psychophysiological coherence, and the emergence of system-wide order. Boulder Creek: Institute of HeartMath; 2006. Davis JJJ. The Brain of Melchizedek: A Cognitive Neuroscience Approach to Spirituality (Thesis, Master of Science). Dunedin: University of Otago; 2009. Childre D, McCraty R. Psychophysiological correlates of spiritual experience. Biofeedback. 2001; 29: 13-17. McCraty R. Heart rhythm coherence - An emerging area of biofeedback. Biofeedback. 2002; 30: 23-25.
van der Eijk P. Body and Spirit in Greek medicine and philosophy [Internet]. 2007 [cited 2018 November 26]. Available from: https://studylib.net/doc/8695304/body-and-spirit-in-greek-medicine-and-philosophy. Freeman WJ, Quiroga RQ. Imaging brain function with EEG - Advanced temporal and spatial analysis of electroencephalographic signals. New York: Springer; 2013. Freeman WJ. Mass Action in the nervous system - Examination of the neurophysiological basis of adaptive behavior through the EEG. New York: Academic Press; 1975. Tarvainen MP, Niskanen J. Kubios HRV User's Guide (Version 2.1). Kuopio: University of Eastern Finland; 2012. McCraty R, Atkinson M. Autonomic assessment report: a comprehensive heart rate variability analysis - interpretation guide and instructions. Boulder Creek: Institute of HeartMath; 1996. Davis JJJ. Pragmatic information, intentionality & consciousness. JCER. 2018; 9: 113-123. HeartMath Inc. Knowledgebase article - HeartMath inner balance trainer coherence scoring system [Internet]. 2018 [cited 2018 November 26]. Available from: https://www.heartmath.com/support/knowledgebase/?article=kA180000000XbZmCAK&t=HeartMath+Inner+Balance+Trainer+Coherence+Scoring+System. McCraty R, Atkinson M, Tomasino D, Tiller WA. The electricity of touch: Detection and measurement of cardiac energy exchange between people. In Pribram KH, editor. Brain and Values: Is a Biological Science of Values Possible. Mahwah: Lawrence Erlbaum Associates, Publishers; 1998. p. 359-379. Denney JM. The effects of compassionate presence on people in comatose states near death. USABPJ. 2008; 7: 11-26. Gillett GR. Subjectivity and being somebody: Human identity and neuroethics. Exeter: Imprint Academic; 2008. Goswami A. A quantum explanation of sheldrake's morphic resonance [Internet]. 2003 [cited 2018 November 26]. Available from: http://www.stealthskater.com/Documents/Consciousness_32.pdf. Sheldrake R. The presence of the past: The morphic resonance and the habits of nature. London: Collins; 1988. Maslow AH. Religions, values, and peak-experiences. New York: Viking Press; 1970. Jung CG. Synchronicity: An acausal connecting principle. Princeton: Princeton University Press; 1973. Kelso JAS, Engstrøm DA. The complementary nature. Cambridge: MIT Press; 2006. McCraty R, Tomasino D. Heart rhythm coherence feedback: A new tool for stress reduction, rehabilitation, and performance enhancement. Proceedings of the First Baltic Forum on Neuronal Regulation and Biofeedback; 2004 November 2-5; Riga, Latvia. p. 1-6. McCraty R. Enhancing emotional, social, and academic learning with heart rhythm coherence feedback. Biofeedback Self Regul. 2005; 33: 130-134.